I'm teaching a sewing class! Did you already know that? If you follow me on twitter, you probably did. It's an in-person class at Needlework, which is an adorable sewing and craft space in Hamilton. I haven't taught since I taught Advanced Theatrical Millinery for George Brown College, but I'm excited to give it a whirl, again! Mostly I'm excited about the topic, which is Hand Sewing and Bow Ties. There are bow ties all over my studio in the cutest patterns and it makes me want to dress up Jay in suspender + bow tie outfits and take pictures. That's two things Jay hates: "outfits" and photos. Muahahah. I illustrated two instruction sheets as handouts for the class, which I will be sharing on the blog so that all of you can spruce up on your hand sewing skills! In the class we'll be covering extra things, like different needles for different applications, types of thread, how to start sewing and knot off, plus I will be there to show you in person what each stitch is supposed to look like and how to make a bow tie! Everyone will leave with some samples of various stitches and a finished bow tie or hair bow. For those of you who can't make it, here are the 8 most important stitches (a.k.a. "The ones I use all the time"). You can use this illustrated printable (click the image to access the full size jpeg) to learn them! An in-and-out basic stitch. It's easy to learn but not very strong. 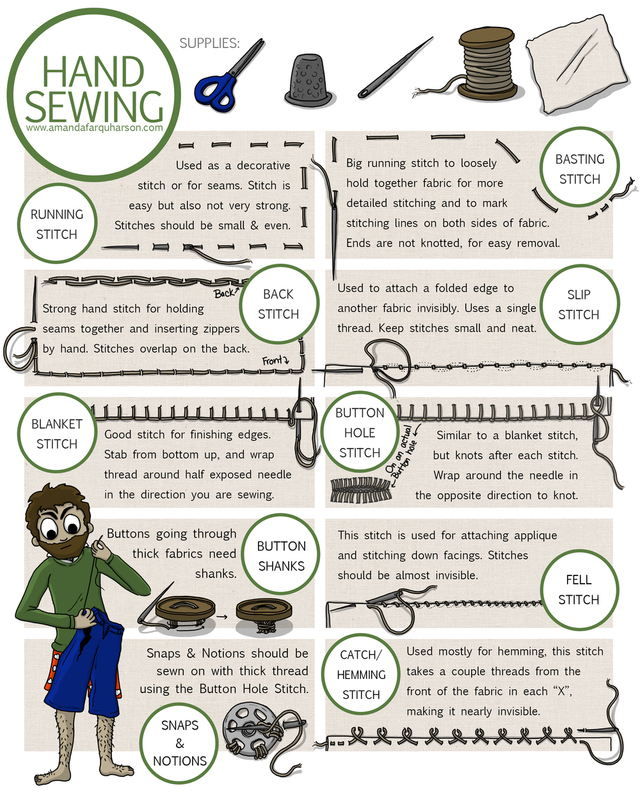 Basting stitch is a long & loose running stitch that's used to lightly tack pieces in place before machine sewing them or using a more complicated stitch. It's also used to mark a stitching line on both sides of the fabric. After the garment is complete, it should be removed. This is a strong stitch used to hold seams together (a machine back stitch is still preferred, but in a pinch, this will do!). This is used to "invisibly" attach a folded piece of fabric to another piece of fabric. Most of the stitch is hidden in the fabric fold. I use this stitch the most, but it requires some patience and practice to do it well. These stitches are very similar. Both are used to finish a raw edge of the fabric, and look similar. The button hole stitch is a bit more time consuming, but it also knots/locks with every stitch, making it very strong and durable. This stitch is sometimes confused with Slip Stitch, and is also used to attach a folded fabric edge to another piece of fabric. It's often used for stitch down facings and applique. It's slightly more visible than a slip stitch. This stitch is used to hem clothes. When done carefully and without pulling the threads too tightly, it looks nearly invisible. Hopefully you find this sheet helpful. If you are interested in knowing more, definitely sign up for the class. I will cover making bow ties next week.